Happy Valentine’s Day friend! I hope you are able to spend time with loved ones today. 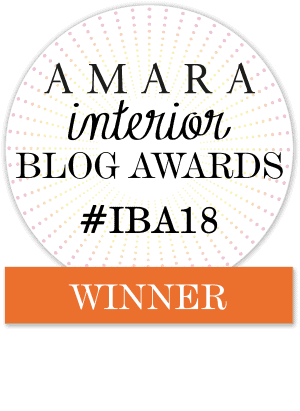 Thank you so much for being an Up to Date Interiors reader. I truly appreciate you! St Patrick’s Day is just around the corner (and hopefully warmer Spring weather!). Just like most holidays, my philosophy for decor is less is more. Well thought out and placed holiday DIYs and appropriate colors and textures can put a festive touch in your home without going overboard. I put together my favorite modern St Patrick’s’ day decor and DIYs that I’ve done in the past. First is this St Patty’s Green and Gold door hanging created using dollar store supplies. Using faux succulents for a filler and ombre shamrocks give it a more modern flare. Adding green with black and white touches is a fun way to incorporate St Patrick’s holiday without taking it literally or too seriously. What a glorious color combo! This vignette was part of the 2016 St Patrick’s Day home tour. The color combo is carried throughout the living space with floral accents to make transitioning into Spring decor easy. This cute little gold shamrock was a quick cut out from metallic tape and put on a succulent pot. Charming! A stack of green books, seaglass, gold frame, and DIY gold leaf shamrock create this light and pretty vignette. The art in the gold frame was simply construction paper with metallic tape. A simple DIY for a large impact. Create a “lucky accent” with polymer clay for a DIY gold horseshoe. I absolutely adore this round of modern St Patty’s DIYs. Please check them out for more inspiration! Thanks so much for stopping by! If you are new here, I’m offering subscribers a free 5 day decorating email course! Learn more here. Love all these ideas Kathy!! The horseshoe from clay is super chic!